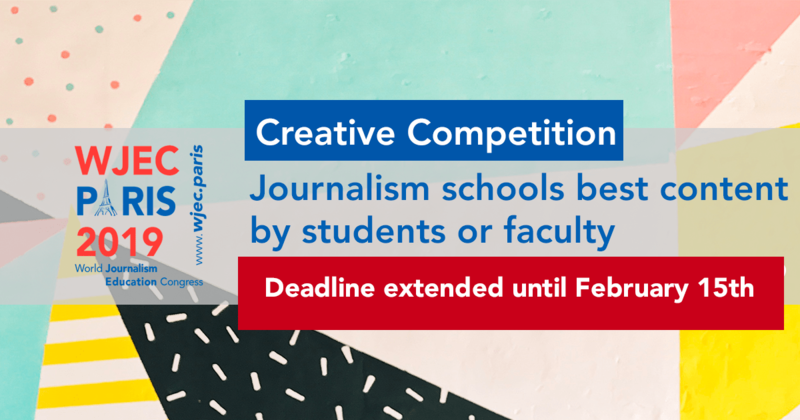 WJEC-5 will highlight the worldwide journalistic creative talents of educators and students during this competition and showcase in Paris. All faculty entries will be peer reviewed and student work will be reviewed by industry professionals and faculty. The Audio News Competition (faculty or student) allows entrants to showcase audio storytelling skills for radio, online or podcasts related to journalism. Entries can include, but are not limited to, the following types of submissions: feature and hard news reporting, newscasts, and audio magazine / public affairs programming. Click here to enter the Faculty Audio News Competition. Click here to enter the Student Audio News Competition. The Documentary Competition (faculty or student) showcases both short-form and long-form journalistic documentaries. Click here to enter the Faculty Documentary Competition. Click here to enter the Student Documentary Competition. The Magazine Competition (student only) recognizes excellence in content creation that demonstrates value, scope creativity and innovation of a student produced publication. Click here to enter the Student Magazine Competiton. The Television News Competition (faculty or student) showcases outstanding video storytelling for television or online video. Entries can include, but are not limited to, the following types of submissions: feature and hard news reporting, newscasts and news magazine / public affairs programming. Click here to enter the Faculty Television News Competition. Click here to enter the Student Television News Competition. The Photojournalism Competition (faculty or student) showcases storytelling through the still image. Categories for photojournalism include single still photograph (with caption) or photo essay (a series of at least 10 photos, with captions), that tell the story of a single subject or event. Click here to enter the Faculty Photojournalism Competition. Click here to enter the Student Photojournalism Competition. All entries must be submitted online (the link will be available on January 7, 2019). Online submissions will be accepted up to February 1, 2019. !!! Deadline extended until February 15th, 2019. Winners will be notified of the results by March 31, 2019. Only works completed between February 1, 2017 and February 1, 2019 are eligible for submission. !!! Deadline extended until February 15th, 2019. The creative competition is open to faculty and students who completed their entry while employed or enrolled full-time at a college or university. Predominant Authorship and Originality: The WJEC Creative Journalism Competition invites submissions of original creative works in which the entrant maintained predominant authorship over the project’s content and aesthetics (producing, directing, writing, editing, etc.). Entries under the role of executive producer are accepted ONLY if as producer the entrant was significantly involved in the entry’s design and creation. The entrant agrees to clear all licenses, copyrights, and permissions to ensure that the submission can legally and ethically be presented at the WJEC convention and online at the WJEC website. If an entity other than the entrant owns the rights to all or part of the submitted program, the entrant must attach written consent from the owner or an authorized representative of the owner to the entry form. For any creative competition queries, please contact the Competition Co-Chairs listed above or Michael Bruce (mdbruce @ au.edu) or Heather Birks (heather @ beaweb.org). WJEC-5 will highlight the worldwide journalistic creative talents of educators and students. NB : Submissions are open until February 1, 2019.